EXCLUSIVE ONE ON ONE FORMAT! SHOWCASE your class work to three influential industry guests on the fourth class! Alaine's specialty is working with actors on scene and character study work. This involves working on the text to sharpen the actor's technique. Additional assignments will be given that help the actors use their own life experiences as a spring board for creative storytelling for their characters. Actors work closely together with a spirit of inspiration rather than competition. All material and scripts will be carefully selected by Alaine for each actor. WEEKS 1-3: Actors will be working with Alaine extensively on scenes that she assigns in class. WEEK 4: Showcase the scenes with an industry panel of three special guests. WEEK 5: Private meetings with Alaine to discuss the overall work as well as the industry feedback. ALSO BRING A HARD COPY OF YOUR HEADSHOT/RESUME TO THE 1ST CLASS!! Alaine Alldaffer (Casting) is also the casting director for Playwrights Horizons, where her credits include GREY GARDENS (also for Broadway), CLYBOURNE PARK (also for Broadway), CIRCLE MIRROR TRANSFORMATION (Drama Desk and Obie Awards for Best Ensemble and an Artios Award for Casting), and THE FLICK (Playwright Horizons and The Barrow Street Theater). Television credits include THE KNIGHTS OF PROSPERITY (aka LET'S ROB MICK JAGGER with Sophia Vergara) for ABC. Associate credits include ED for NBC and MONK for USA. 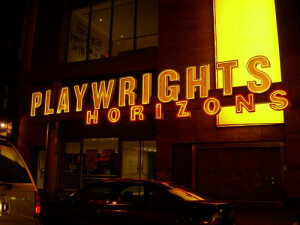 Regional Theaters include Arena Stage, Williamstown Theatre Festival, Seattle Rep, ACT, and Berkeley Rep, among others. Other notable theater productions include: DETROIT with David Schwimmer and John Cullum, RAPTURE BLISTER BURN, BETHANY with America Ferrera, DEAD MAN’S CELLPHONE with Mary Louise Parker, EVERY TONGUE CONFESS with Phylicia Reshad, and A LIFE with David Hyde Pierce. After studying with Alaine Alldaffer, I got called in for the title role in the play Yerma at the Huntington Theatre!